Bunnahabhain Distillery continues to produce some of my favourite single malt scotches. The regular Bunnahabhain single malt range is focused on European oak, and contains no obvious peat notes. Occasionally, though, Senior Blender Dr. Kristie McCallum sneaks out a peated single malt! They’re terrific. 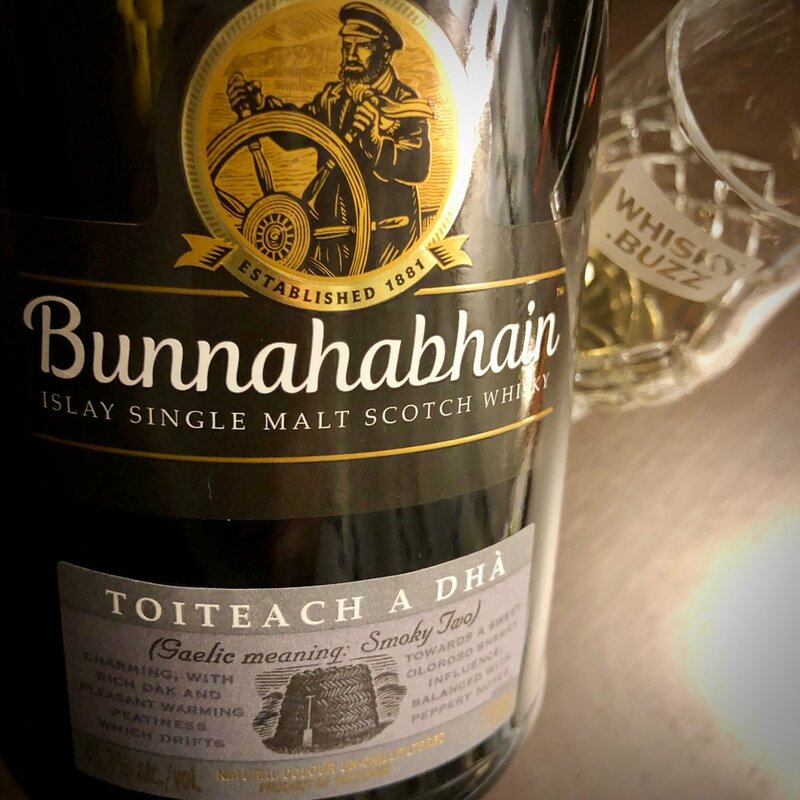 Meaning 'Smoky Two' in Scots Gaelic, Toiteach A Dhà (pronounced Toch-ach ah-ghaa) is a sequel to the original peaty paradox on Bunnahabhain’s gentle single malt. To create this Mòine variant, our Senior Blender, Dr. Kirstie McCallum selected a combination of ex Bourbon and Sherry casks which were then matured in full, in our coastal warehouses on Bunnahabhain Bay. This is a terrific whisky. It is in a very competitive marketplace, so I don’t know where it fits into the grand scheme of things, but if you’re a Bunnahabhain fan (like I am!) you’ll be happy with this purchase. Nose: The caramel notes from the sherry casks are sweet and dry, and between the caramel and the char smokiness, they nearly overpower some of the fainter complex notes. There’s a charged lemon zest to this, and hints of vanilla pods. Palate: A surprising hit of ginger and peppery spice. Each time I had this, I’m expected caramels, but the sweet caramel notes is secondary. The middle-palate is wonderfully buttery and sweet, though, and it tastes boozy considering it’s 46.3% ABV. Bunnahabhain’s distinct malted barley characteristics do come through, though, and that’s terrific. A whisky that keeps you on edge—it’s heavy sherry oak influences show on the nose, and American oak takes over the palate. I really enjoyed this scotch, but it’s a little twisted between nose and palate. The nose hints at a sweet dry sherry bomb, but the palate delivers the opposite, with a scotch that’s peppery spice forward. It’s got a funky edgy push in flavor that I enjoy. My only warning is, if you’re in the mood for a smoky sherry bomb, this won’t fit your palate’s expectations. The no-age statement peated category with sherry influences is growing, and it’s become incredibly competitive. However, this whisky comes in at 46.3% ABV, is non-chill filtered, and packs a lot of flavour making it a contender. Disclaimer: I was graciously provided a bottle of whisky from the distillery. There was no expectation that I review the whisky, and it played no part in the review.